Maddie Ross and Dan Powers won’t open their Christmas presents from under the warm glow of a Yule tree this year. The couple, who plan to marry in August, lost their Beacon Hill apartment to a house fire Wednesday night. They also lost two beloved dogs. Heartbroken, Ross, 28, and Powers, 29, exchanged gifts Thursday on the sidewalk outside 80 Revere St., where they had rented a second-floor apartment for more than a year. Ross’s dad, Larry, stood behind the open trunk of their SUV, ripping open packages to determine which could be salvaged. He paused on one gift, and handed it to his daughter unopened. “Merry Christmas,” he said, his voicing cracking. Inside was a book about fishing, a tradition for Ross and her father. It was undamaged in the fire. Ross’s parents were visiting from Connecticut to celebrate Christmas with her, her two brothers, and her fiancé. The six had gone out to dinner at about 7 p.m. They left Brady, Ross’s 8-year-old black Labrador Retriever and Great Dane mix, with her parents’ two Puggles, 10-year-old Meeya and 4-year-old Leo. When they returned just after 8 p.m., firefighters were battling a two-alarm blaze in the apartment. Brady and Leo were lying on the sidewalk, rescuers trying unsuccessfully to resuscitate them, Powers said. Investigators believe the fire started from the left side of the stove, Powers said, but they’re not sure how. It was extinguished before it spread to other units, but Ross and Powers’ unit was said to be a total loss. 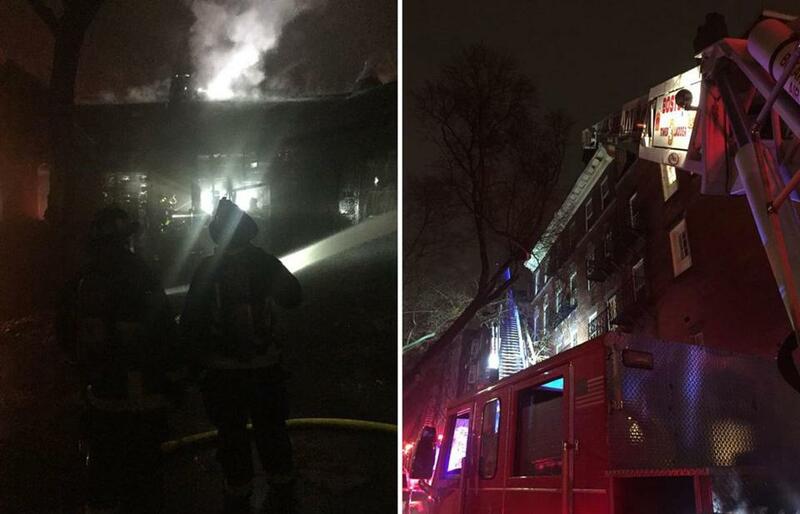 Boston fire officials estimated $60,000 in damage. “A lot of our Christmas presents were destroyed, which in retrospect, who really cares? But we were just really excited to have gotten so many great things for each other and be able to share,” Ross said. Inside the apartment on Thursday, the white walls had turned black, and pieces of burned cabinets and appliances littered the kitchen floor. The bathroom window was lying shattered in the tub; soot covered the toilet and sink. In the living room, the Christmas tree was lying on its side, its lights tangled and bristles singed. Outside, neighbors stopped by every 10 to 15 minutes, offering food, showers, and places to sleep. One man invited the entire family over for Christmas dinner. Maddie Ross thanked each one and stood solemnly outside, looking at her bags of salvaged belongings, tears in her eyes.